So, I know that my brain was made incompetent by pregnancy when I fixed up the guest room last time. I had a mish mash of weirdness going on in there with too many patterns, nothing on the walls, and an unfinished feel. I couldn't change the curtains, bed, or rug, but I could add different elements to unify the big pieces better. Now we have actual guests coming this weekend, so I set about fixing some of the awkwardness before they get here. The changes are subtle, but I think they make a big impact. This whole thing started with Ash taking an amazing extended nap that got me raring to do something. First, I hung some round mirrors up in this room that have been on the floor of our room since I painted them in 2009. Seriously. I like how they kind of look like portholes in here! I also like looking at myself when I change the sheets on the bed. I'm kidding. No really, I'm not. I also added some little accessories to the dresser top...a red vase, and some new candles. New navy sheets tie in the curtains. All of these additions are from TJ Maxx, of course. I had a lovely vintage print from the room that became the nursery. Well hello, 2008! It looks perfect in here, good thing because it had been leaning against a wall for months. I would love a narrow buffet or console table for this wall, but I'm not in the market for new furniture right now, so this Ikea nightstand works. But the best thing, at least to me, is the charming piece of art above the bed. When I saw this print on art.com, I just had to spring for it. With a groupon, it was much more affordable. I've never spent $50 on an art print in my life, and this girl wasn't going to change my mind. I was excited to find something with both the red and the dark blue in it, and the cute message sealed the deal. I wish I could've gotten it custom framed to eliminate the white border, but I opted for a cheaper pre-made frame for the larger 18x24 size. Maybe I will pick up a natural colored mat and cut it to fit? Sure, I can hear Ashford laughing. I know the nightstand is too short for the bed and the lamp doesn't really work in here, but I'm not able to change them. PS - I forgot to take Shaun's 'Muscle and Fitness' magazine out from under the nightstand. HA! So, did I improve this room?? it's such a great space! your guests will love it! 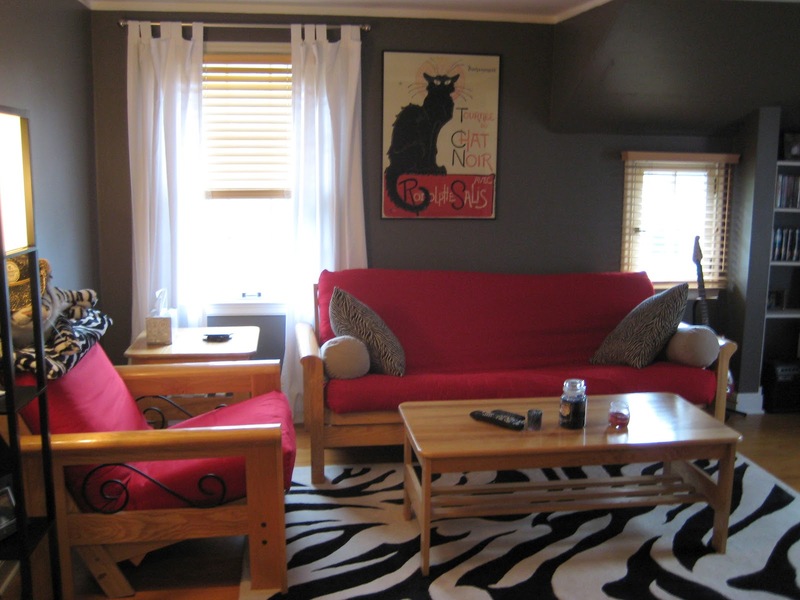 I think its a lovely space; I love the vintage art print (I own many, including the cat). Yes, you definitely improved it! Amazing to see how just a few little tweaks can make a room work a lot better! Yes, everything you do is great! Great touches -- your guests will love the room. I've always been a fan of that bedding, and love the drape fabric. Glad to hear you're feeling better! HA! Yeah, I have been boring lately...can't argue with that. Wow, it looks great. It was a bit jumbled before but your improvements really pull things together. Just an idea, what if you put the ikea nightstand by the bed and a luggage rack under the cat poster? the hemmes might solve your "too short for bed" problem and a rack would look super cute under the vintage cat poster (and keep older guests from having to bend to the floor). I love this. I can't freaking believe how just a few tweaks totally made it all come together. The print is awesome. For some reason I didn't even notice the duvet until the change. I was all, "I love the new bedding!" until I scrolled up and saw that it was the same bedding with different pillows. I guess it really made a difference! I'm really in a work with what you have state of mind right now so I can really appreciate the reuse of the pictures furniture... rock on. Looks great! I love the rug. Sara, great job. When I had a newborn, my guest bedroom was the only sane place in my house. The rest was taken over by baby stuff and neglected cleaning. Enjoy this wonderful space... And appreciate that the rest of your house is making a wonderful home for your baby. That's what matters.